HID Global announced a solution for government agencies interested in securing Apple iOS devices with access to sensitive data. The solution combines the ActivClient Mobile Software Development Kit for iOS with two sleeves from Precise Biometrics: the Tactivo iPhone sleeve and the Tactivo iPad sleeve. This solution enables government agencies of all kinds to use their Common Access Card or PIV to secure communications and access to sensitive information by encrypting it through standard PKI encryption methods. For government agencies interested in deploying a more integrated solution, HID Global offers a solution leveraging “derived credentials”, a concept recently introduced in the draft of FIPS 201-2. The approach taken by HID Global applies the “derived credential” to a secure microSD card, a secure element with the same cryptographic services as the CAC or PIV smart card. This microSD format can be connected to iPhones with a sleeve. The ActivClient Mobile Software Development Kit for iOS enables application developers and government entities to deliver two-factor authentication, signature and decryption technologies for all iOS devices, including iPhone and iPad. These devices have led the charge in the Bring-Your-Own-Device phenomenon, causing a shift in the way government employee’s access their corporate email and other resources. 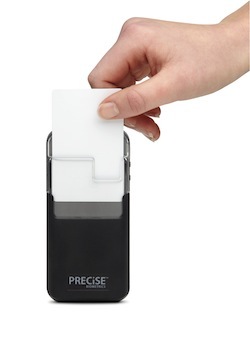 The Precise Biometrics Tactivo Smart Card & Fingerprint Reader enables multi-factor authentication on iPad and iPhone, supporting U.S. government credentials including PIV, PIV-I, CAC and TWIC, as well as the Precise Match-on-Card credentials used in many national IDs. ActivClient Mobile SDK for iOS provides a layer of middleware that connects strong two-factor authentication credentials to applications and encrypted ‘containers’ running secure application stacks on the mobile device.